I’ve gotta be honest, I kind of get tired of cooking three square meals every day. I’m just being real. I let my Vitamix do the work sometimes… ok, a lot of the time, and I make puddings, protein drinks, and smoothies quite often. I love to make a quick, yummy blueberry chia seed smoothie on occasion, since it’s super simple and packed full of nutrition. Smoothies started as a way for me to sneak in a plethora of super health foods. I got really over the top for a while and have put everything from steamed mushrooms to liver in smoothies. Now, I keep my smoothies pretty basic and use just a handful of key ingredients. It’s also important that smoothies be fast and easy to make, as my husband likes to blend one on his way out the door to work, and my kids like to be able to make smoothies themselves. While you can get fancy and add lots of ingredients, I like to keep it simple, sir. Like, really simple. This blueberry chia seed smoothie is super simple and nourishing, and best of all, kid-pleasing. Organic frozen blueberries- I always make sure to buy berries organic because they are one of the most likely types of produce to have a high amount of pesticide residue. Blueberries are rich in vitamin C and antioxidants, which help to keep you youthful and repair damaged cells. Buying them frozen makes for a perfect, icy smoothie texture. Chia seeds- these tiny nutrition powerhouses pack a huge punch in a small package. In just one ounce, you’ll find over 4g protein, 9g fat (good, essential fatty acid, omega fats! 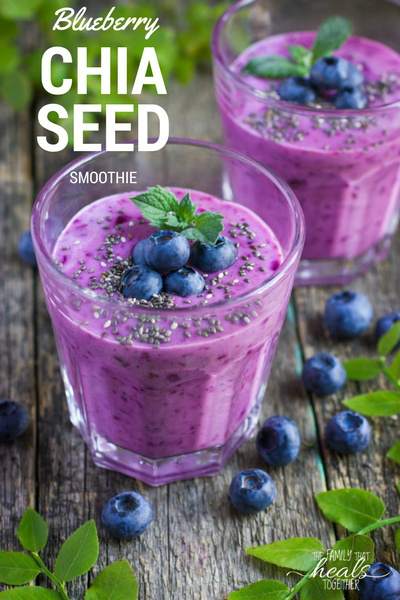 ), tons of calcium and magnesium, plus fiber, antioxidants, and other nutrition that make this little seed worthy of scooping into your daily smoothie. Raw milk- Our family loves raw milk, for the nutrition, and pure enjoyment of all the foods we can make from it, like ice cream, plus there’s the satisfaction of a tall glass of cold milk. Raw milk also boasts 8g protein per cup, as well as vitamins D, K, and A, and heart-healthy saturated fat found in the cream. If you don’t tolerate dairy or can’t get your hands on raw milk, coconut milk is a good substitution. Greens- I also like to throw a handful of fresh, raw greens in my smoothies to bump up the nutrition. Kale is a favorite, as well as spinach, but really, anything will do. Fresh greens boast vitamins K and C, as well as fiber. Be sure to blend your smoothie up well, as chia seeds have a unique texture, and the better they’re blended, the less noticeable they’ll be. I love using my Vitamix for this because it’s powerful and blends things very smoothly. 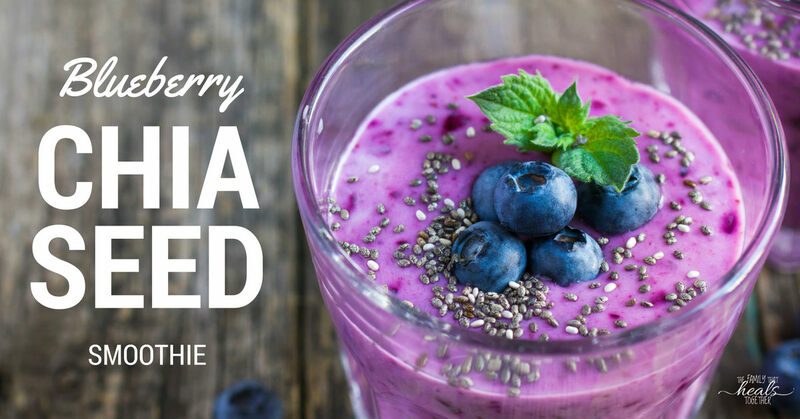 Know a friend who would love this blueberry chia seed smoothie? Share using one of our links! Paleo Preserves… in a Bread Machine? How to Use Essential Oils for Stress Relief: Try This Soothing Blend!